​Dartmouth needs to expose students to diversity in classrooms. Every year, soon after welcoming a new class of eager and wide-eyed freshmen, Dartmouth releases a report on its demographics. In recent years, these reports boast increasingly high percentages of students of color, students who attended public schools and international students. The admissions board and administration congratulate themselves for admitting such diverse classes. At the same time, they turn their backs on what Dartmouth’s community looks like for these students once they actually step foot on campus. The benefits of a diverse student body are clear. Bringing together a multitude of backgrounds and identities not only enhances the intellectual environment for students but also enriches the social communities formed on campus. Socially diverse campuses enjoy groups that include members whose different qualities can exist in harmony, transcending the divisive nature of contrasting backgrounds and appreciating what each person can share. As a result, students gain a broader perspective and deeper understanding of the world. To be a future leader and, really, a decent citizen, this experience is essential. Dartmouth is socially segregated by race, socioeconomic class and culture. Administrative faculty’s attempts to implement diversity are brochure-deep. A truly diverse college does not happen simply by putting students on the same campus and expecting them to integrate naturally. The ambiguous plans the College has launched fade out quickly and easily. The College’s Office of Diversity and Equity claims to have initiated several programs to encourage diversity and inclusivity among students, but many are not widely-reaching or effective. Three how-to articles are tucked away on a Programs and Outreach webpage. They teach students how to communicate when faced with the challenges of interacting with culturally different peers. Much of the advice is unrealistic and not naturally applicable to the daily conversations of my generation. Dartmouth recently launched a new program called Inclusive Excellence. It is the first time that actionable plans have been published by the College for everyone to see. Students, faculty and staff alike can track the progress of each task and hold the College accountable. This seemed promising until I saw that one of the tasks dedicated to building an inclusive community was to use orientation programs for the Class of 2020 and beyond to train students on diversity and inclusivity. Although it had been marked as completed, I fail to recall any significant training in the areas of diversity and inclusion during my orientation. Many students are not deliberately rejecting diversity in their social lives. They simply lack exposure. The U.S. is still very much segregated, and most students have grown up in homogenous environments. Dartmouth is the first place where these individuals interact with diverse peers, and they aren’t equipped with the proper understanding to do so constructively. They misunderstand, unintentionally exclude or offend people because they do not know how to relate to the “other.” Underrepresented students and minorities are often victims of this type of ignorance. To prevent circumstances where interactions may become uncomfortable or offensive, they thus form groups with others who share their same experiences. This increases the divide between groups on campus and creates a self-perpetuating cycle of separation and misunderstanding. 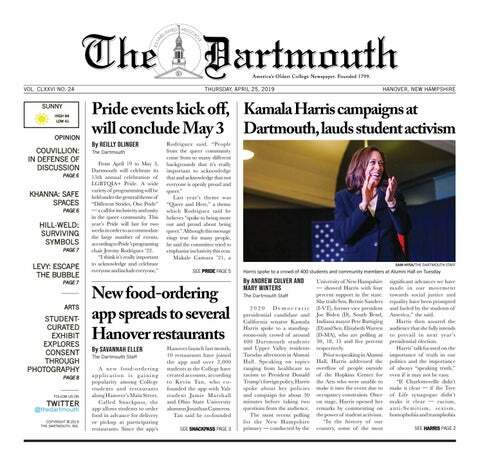 To address this issue, Dartmouth should dedicate a portion of this education to teaching students how to understand and interact with different cultures, identities and backgrounds. There should be a mandatory course for first-year students that does just this. This course could include, for example, a seminar that breaks down faulty stereotypes perpetuated by society and acknowledges the historical basis behind much of the conflict and unrest between groups, as well as activities that call on students to challenge their observed and unobserved biases. Such a class can provide students with the skills to form meaningful relationships for the next three years and in life after graduation. If Dartmouth can require students to take three credits worth of P.E. classes, it can find room for a course that helps students break down established barriers between peers. Adewuya is a member of the Class of 2020.